CAN YOU TELL BENGAL SLOW LORIS AND PYGMY LORIS APART? HomeCAN YOU TELL BENGAL SLOW LORIS AND PYGMY LORIS APART? 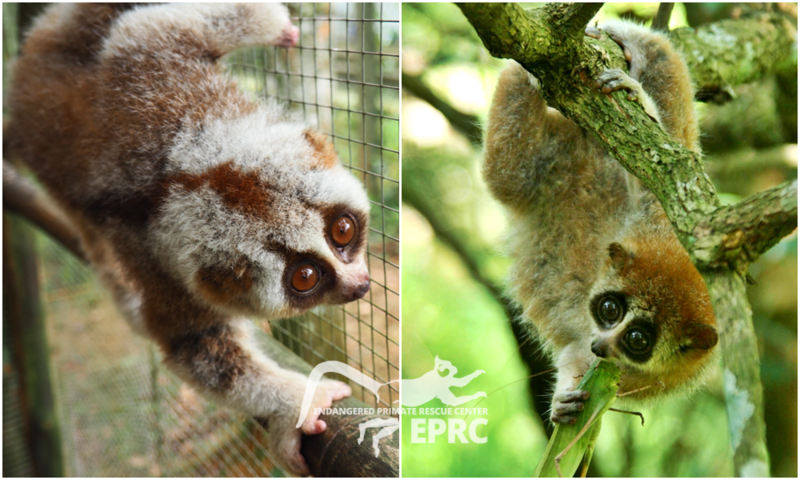 They both belong to the Slow Loris group (Nycticebus) and they are both native to Vietnam. They are both classified as “Vulnerable” as their population in the wild is decreasing rapidly due to illegal trade and bushmeat. Bengal slow loris is the largest species of slow loris. One adult can weight from 1-2.1 kg. Meanwhile, an adult pygmy loris can top only 450 gram – 650 gram. Bengal slow loris has Pink feet and ears. Pygmy loris has Black feet and ears. Bengal slow loris has brown-gray fur on its back and white fur on its underside. Pygmy loris has reddish-brown fur in summer. In winter, gray hairs intermingle with the brown hair and a blackish stripe appears on its back. And don’t forget to DONATEto EPRC so we can continue our hard job in conserving these endangered primates in Vietnam!